1.2 At the Top of Burj Khalifa – Level 124 & 145 or Level 148? 1.5.1 DISCLAIMER: THIS POST CONTAINS AFFILIATE LINKS – THIS MEANS I MIGHT EARN A SMALL COMMISSION WHEN YOU BUY A PRODUCT/SERVICE (AT NO EXTRA COST TO YOU). MORE ABOUT IT HERE. I guess I am not the only one who wants to visit Burj Khalifa – the highest building in the world which is located in Dubai Downtown, UAE. It had been on my bucket list for quite a while visit to the top of Burj Khalifa in Dubai. I missed it on my first trip but I made sure to visit at my second visit. And at my fourth trip. Yes, by now I have visited the top of Burj Khalifa several times and it is because I really enjoyed it. Burj Khalifa is the tallest building in the world – making it one of the most famous buildings in the world. It is now standing at 828 meters high and has become one main attraction in Dubai. At night it gets wonderfully illuminated (LED shows at certain times) and it doesn’t really matter if you visit at daytime or in the evening – this place is a must-see place. In this post you can find out more about Burj Khalifa: Some facts, information about visiting the building and if it is worth it. 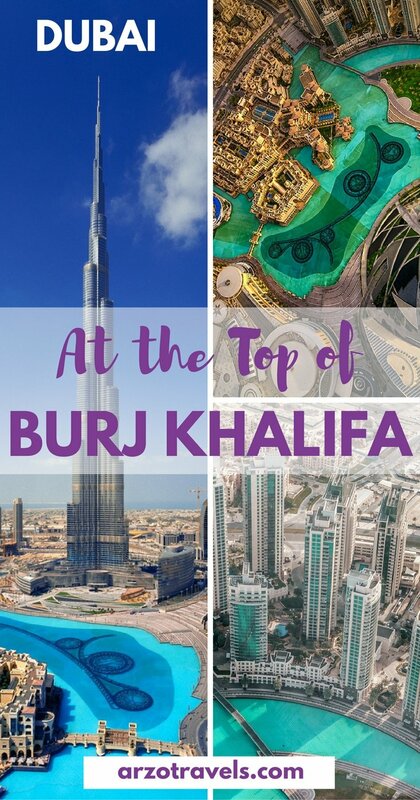 You will find out about the ticket prices for the Top of Burj Khalifa, about opening hours, and more important information. Burj Khalifa is home to offices, some luxury apartments, the luxury Armani hotel and a fine dining restaurant at 442 meters. And then there are the two observation desk that can be visited and which I will write a bit more later. Its unique shape makes Burj Khalifa distinctive but of course, its height, standing tall in 555 meters with 160 stories, is the most important feature. It doesn’t really matter where you stay in Dubai (or even in the neighbor emirate of Sharjah), the building is almost visible from any place. As you can see, there are several records that Burj Khalifa holds. 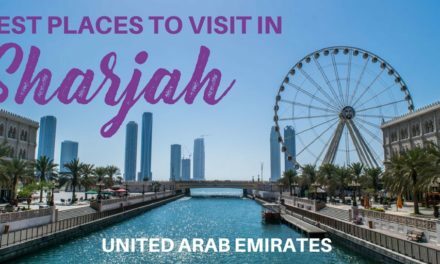 It is located in Dubai Downtown on 1 Sheikh Mohammed bin Rashid Blvd, next to the Dubai Mall (the biggest mall in the world) and Dubai Fountain. Well, apparently it is impossible to miss Burj Khalifa but finding the “entrance” takes some time. From the airport to the tower it takes about 20 minutes drive – without traffic (15km). It takes about the same getting from the highest tower in the world to the most expensive hotel in the world -Burj al-Arab (16km). I had access to level 124 and 125 and, either way, you have to get the ticket from Dubai Mall at the ticket store. It is on the LG floor, and there are signs with “At the top of Burj Khalifa“ everywhere. For us normal people there seems to be no direct way to get into Burj Khalifa and we all have to go there in order to get up. At the Top of Burj Khalifa – Level 124 & 145 or Level 148? There are two ticket options available. Either you can get access to level 124 and 125 or to level 148 (and level 124 and 125). Level 148 is at 555 meters, level 125 at 456 meters above the ground. All levels offer stunning views – but there are some differences which you should know about. It makes a huge difference regarding prices and services (there is a fast lane for level 148). As far as I have heard, it does not offer necessarily a much better view though. If you book your ticket for level 148 you can also visit level 124 and level 125 + you have access to the Sky Lounge. Of course, this makes it easier to rest after all the hectic you will experience at the ticket center (you can reduce the stress by buying tickets in advance, however, it will probably not be without any stress at all). 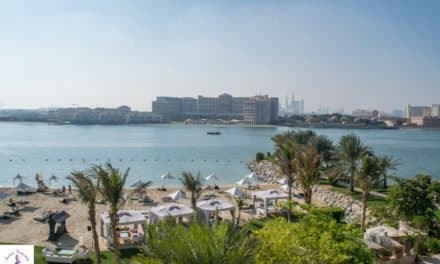 Kids under the age of 4 don’t have to pay any entry (for no level), kids between 4-12 years pay less – however, there is only a reduction for level 124 and 125 (no reduction prices for level 148). Once you have decided whether you are happy with level 124 & 125 or with level 148 you have to decide on the time of your visit. I came here twice and to be honest, no one checked the exact time. Mostly, because it is so busy it is difficult to be here totally on time. So, while you decide on the time, don’t worry if you will be late because you stood in line for too long. However, there are different timings for the visit. You can also buy fast track tickets but as I could see, ticket prices are about the same as for level 148, so I would rather buy a ticket for level 148 and you can skip the lines, too. Tip: I can’t guarantee it, but I saw families with little kids who were allowed to skip the lines (which is totally understandable). If you are lucky and don’t buy the more expensive ticket for level 148 you still might get a fast-track entry if you are with little (not the bigger teenager ones) ones. 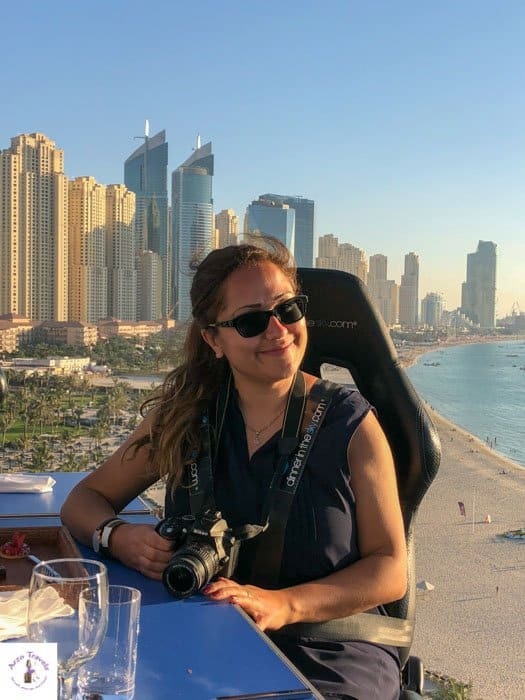 When I visited the Burj Khalifa for the second time, I bought tickets that included a dinner in the Burj Club. THAT was totally worth the money. Check out prices for a nice lunch/dinner with a view including tickets for Burj Khalifa. Watching the Dubai Fountain Show from above is amazing. So here are the show times (if you like to book your tickets accordingly). 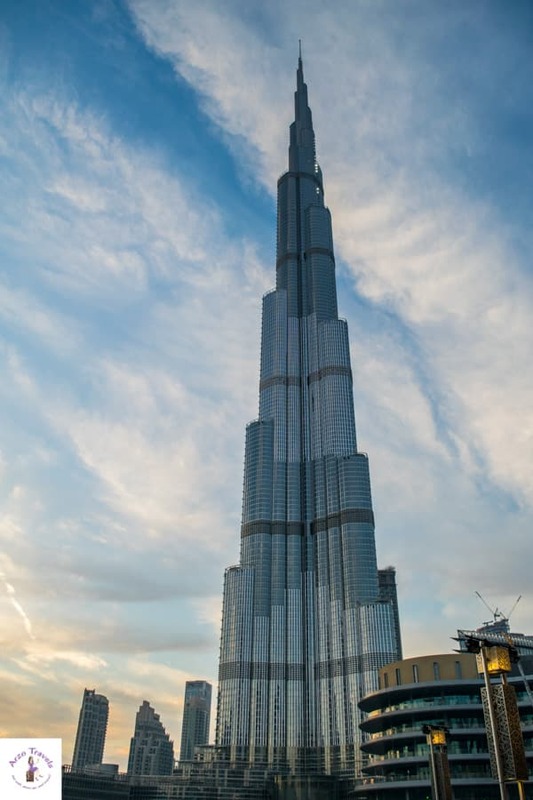 Burj Khalifa is very popular – tickets can be sold out quickly during busy times. So, buying online tickets in advice is a must between November and April. However, even if you get the ticket online, you need to get to the first floor I mentioned in the “location” paragraph. If you have your ticket you need to stand in another line to get up Burj Khalifa. You might have to stand in line for quite a while. If you do not have a VIP ticket (level 148) you need to be patient. While the views aren’t supposed to be better, using the fast track is probably worth it. You have to pass security (remember to not carry illegal things with you) and then walk to the elevator (this includes more standing in line). When you take the lift, you will hear some interesting facts about the highest building in the world. This makes waiting a bit less boring, but it can still be tiring. After waiting for quite a while I was there: At the Top of Burj Khalifa. After over 45 minutes of waiting, I finally arrived at level 125. The view was nice, but the first impression was not overwhelming. I was looking for THAT one particular view. A view I had seen on social media before: The view of the Water Fountain and Dubai Mall. This spot was one of the most crowded – apparently, I was not the only one who wanted to enjoy this particular view. When I finally found that spot, I realized the waiting was worth it. 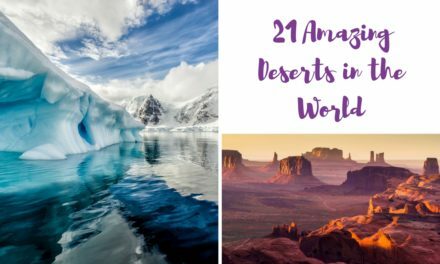 The view was stunning, and as the Water Fountain Show was going on, it was heavily crowded. People were delighted to see the spectacle from the top of Burj Khalifa. Once the show stopped, and the crowd cleared up (funny how quickly that happened), I waited for another half hour to witness the show again. Watching the water show from above was just nice. However, it is difficult to get good pictures through a window, but I tried my best. 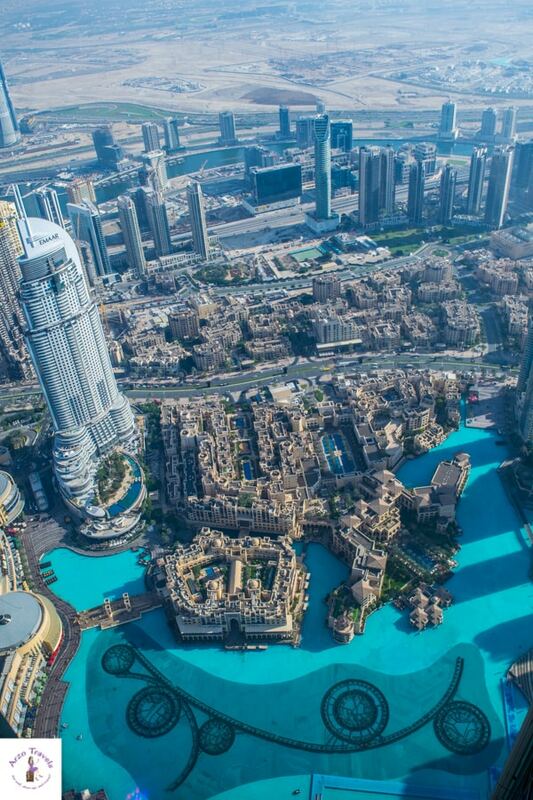 Is it worth to get at the top of Burj Khalifa? I am happy I have visited Burj Khalifa (twice) and except for the long waiting, it was a great experience to get up there. However, if you are willing to pay a lot extra, level 148 might be a good choice. You can buy the “skip the line” ticket here with some extra VIP services. 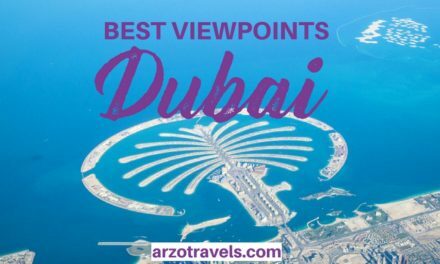 If you are okay waiting in line and not getting treated like a VIP, the ladder option is a great opportunity to see the Dubai from the top of Burj Khalifa.